Not that I expect anything clever on the internet over 80% of the time (RPGFan is a good place though! ), yeah, this kinda stuff happens. Ah well, congrats to the first-ever Indian-American Miss America (and yeah, she was born in NY). 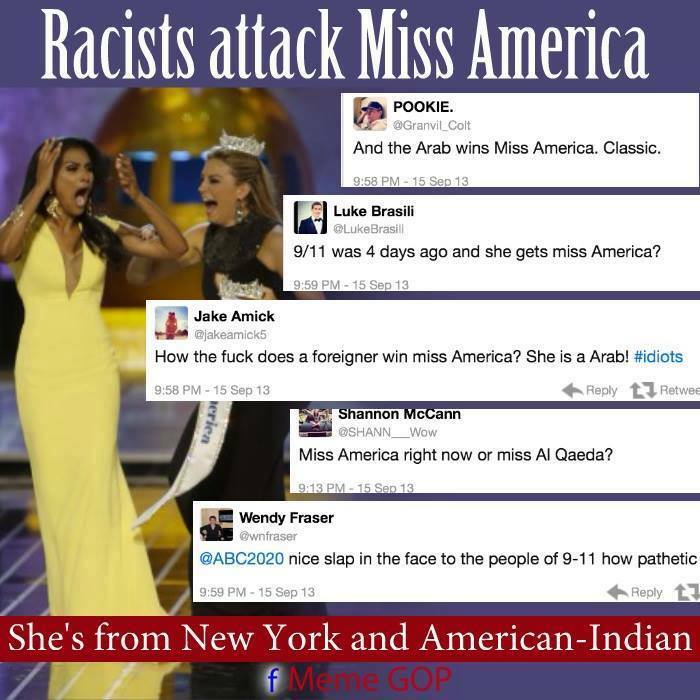 I agree that the new Miss America doesn't represent American values. She needs to be at least 150 pounds heavier with an exceptionally poor understanding of geography of she's going to represent the America that I know and love. That last comment is the best one, hah. How ignorant can people be. She was actually in charge of telling which terrorist was to go each of the two planes....or something....wtf? So, does this mean RPGFan's readership is now going to decline because they've had me on their staff since 2004? I think readership started declining when I started writing on staff and was"blatantly anti-JRPG." My favorite video codec pack is a commie too. People always freak out when I go to http://www.cccp-project.net/ on their computer. Dude what if someone was half American Indian and half Indian-American and people'd be like "WHAT IS YOUR RACIAL BACKGROUND" and they'd be all "I'm an Indian" and the other person'd be all "INDIA INDIAN OR AMERICAN INDIAN?" and they'd be all ":D"
I just realized... where's her birth certificate? I was surprised to see that stuff; on the other hand, one article that I read on the subject pointed out that the fact that the ranting has to be limited to peoples' Twitter accounts and/or blogs is progress from where we used to be. The cave dwellers essentially have to pick up a megaphone to have a voice now. Also, I found the whole thing bizarrely hilarious and/or because neither her name nor her appearance say "Arab" to me. Also, lol at Indian Indian/American Indian mix and the confusion that would result. Elizabeth Hasselbeck is a moron. It's sad that I get my news from Comedy Central and get my comedy from Fox news. The government should track how much violent video games our kids are playing. God knows it's impossible for parents to do it. Who'd spent time with their kids... bleeeeegh !